It's a fact that Samsonite is a champion among luggage manufacturers. They rarely make something not worth buying, and pretty much the only reason you wouldn't get a Samsonite suitcase is the price tag. Their suitcases can get really expensive, but luckily that's not the case with the Mightlight collection. These particular Samsonite softshells are not only incredibly affordable, but also packed with features. We'll take a look at those features separately, to help you figure out whether the Mightlights are worth it or not. Spoiler alert: if you are a fan of softshells, you will love these suitcases. And if you keep reading this review of the Mightlight luggage, you'll find out why they are so popular with frequent travellers! Is Investing In A Mightlight Suitcase Smart? 19.0" x 15.0" x 8.3"
21.0" x 15.0" x 8.3"
25.5" x 18.0" x 9.5"
30.5" x 20.0" x 11.0"
The first thing you notice is that the Mightlight collection features softshell suitcases of four sizes. 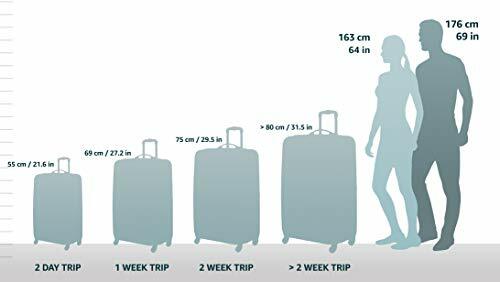 The two smaller ones are carry-on sized, while the larger two suitcases would have to be checked at an airport. But, whether you are looking for luggage for an overnight trip or a week long vacation, the Mightlight collection from Samsonite has something in store for you. The second thing you notice is the weight. These Samsonites are all very light, which makes packing easier. All airlines have a weight limit for both in-cabin and checked baggage, and you will easily stay below that limit with the Mightlight collection. Plus the lighter the suitcase the more clothes you can pack, which is always a bonus! And non-flying travellers can also benefit from the light weight of this luggage. But also from all the other cool features that the Mightlight collection is equipped with. So, let's talk about those for a little while! The main material featured in this collection is nylon. That fabric is often used in not only suitcases, but also in all kinds of backpacks, due to its ruggedness and durability. Just think of the weather conditions you put your favorite hiking backpack through - any Mightlight suitcase could also survive them. Additionally, this luggage features SamGuard Protection - an extra coating of nylon and polyester that makes the luggage ultra durable. That coating also helps make the Mightlight suitcases water-resistant, which is one of the main issues people experience with softshell luggage. Well, with cheap softshells is more like it. 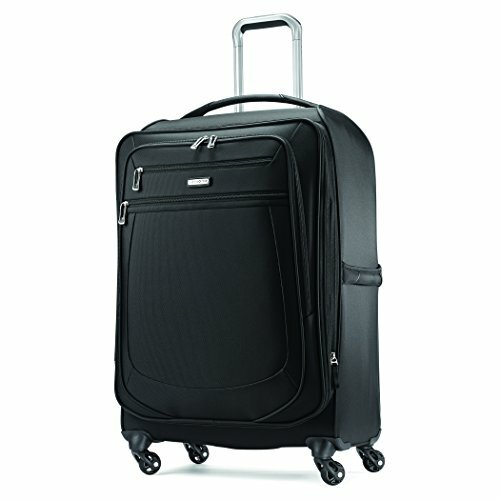 However, Samsonite is a premium luggage manufacturer and they always put performance of their products first. And in terms of durability and strength, their softshells are almost as sturdy as their hardshells. You know, one reason why I avoid softshells is because it's sooo hard to find ones with spinner wheels, but that aren't ridiculously overpriced. And imagine my surprise when I stumbled upon the Mightlight luggage! 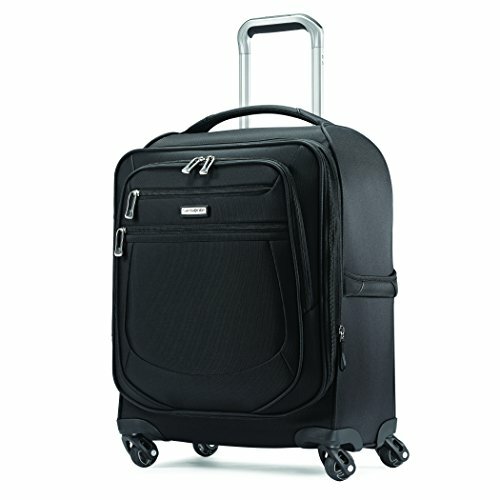 Every suitcase in this Samsonite collection features wheels that are able to turn 360 degrees each - spinner wheels. With these wheels you don't have to tilt your luggage to get it rolling, like you have to with in-line skate wheels. With spinner wheels, you can drag your suitcase alongside you or push it in front of you - it can move in every direction while it's standing upright. What that basically means is that you'll never again have sore arms from dragging 20 lbs behind you. One downside of spinner wheels is that you have to careful not to break them. They roll like a dream, but if you manage to damage them, that dream can easily turn into a nightmare. Don't drag your suitcase down (or up) a flight of stairs, because that could easily mean the end of its wheels. How many times have you sat on top of your suitcase just to close it? I can't even remember how many times I had to do that, which is one of the reasons why I appreciate luggage with expandable capacity so much. This feature comes in handy for a couple of reasons. The first one is that it makes closing an overpacked suitcase much easier than it normally is. Your suitcase is brimming with clothes? No problem! 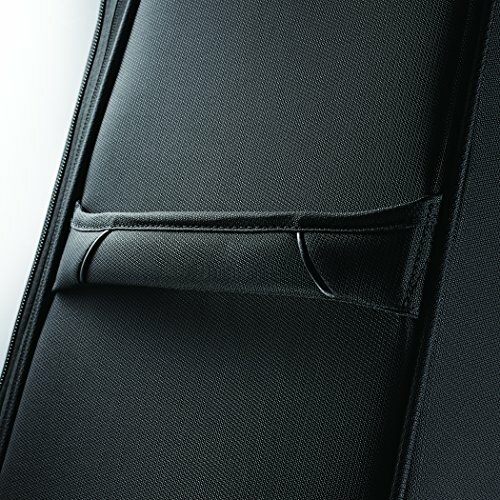 Unzip the expansion zipper, gain two inches of storage space and then easily close your suitcase. Give it an hour or two for the clothes to compress a little inside, and then close the expansion zipper as well. The other reason to love expandable luggage is shopping on your trip. Even if you didn't overpack your suitcase, it can sometimes be tough to fit all the new things you bought inside it. But with expandable suitcases, that is rarely an issue. 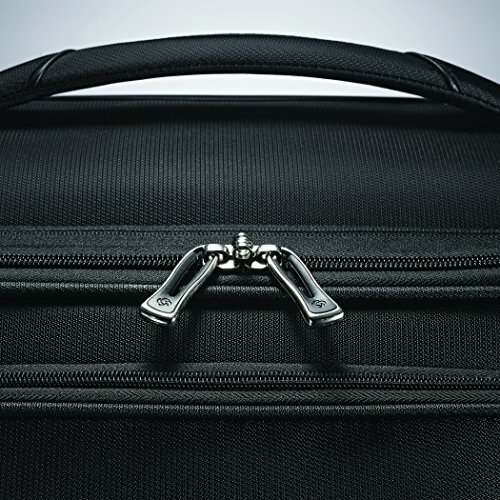 The wheel handle on the Mightlight luggage is a double barrel retractable handle. It locks into position when extended, and it safely tucks away inside when not in use. Two things to note here; one, the handle can't be locked into multiple positions when extended. That means that not everyone will get it to fit their height just right. Some people might find the handle to be to tall, while others might find it to be too short, with a few lucky shoppers getting the perfect fit. The second thing to note is that the handle inevitably protrudes into the packing compartment. That is a little bit annoying, and it's generally easier to deal with when your luggage has a single-barrel handle. But it's not a big deal. Mightlight suitcases also features carry handles on the side and the top. These are made from the same nylon that the body of the luggage is made of, so they are pretty sturdy. But, they are not the most comfortable carry handles you'll encounter. One reason why I love softshells is that they always have exterior pockets. And the Mightlights are no different there - every suitcase has four exterior compartments. Three are on the front, and they are just the right size for your laptop, jacket, wallet and all other items you might need to take out of your suitcase before you reach your final destination. The final, and the smallest pocket is on the side of the suitcase. It can't fit a lot, but it's the perfect size for your passport and plane ticket! Generally, these add to the value of the luggage. They really help with organization, and they allow you to find a dedicated spot for all your items. Without a doubt, the most important feature of any suitcase is its packing compartment. After all, that's why you are buying it - to pack stuff inside it! So, what is the packing compartment of the Mightlight suitcases like? It's pretty good, let me tell you! There is one packing compartment in these suitcases, just like you see in most other softshells. But it is packed with features, which make organizing the clothes inside it come naturally as you pack. The packing compartment is pretty deep and you will be able to put plenty of clothes inside it. And the elastic straps will keep it all in place, and ensure that your neatly packed suitcase doesn't become a jumbled mess. You get two mesh side pockets in the main compartment, for your socks, underwear and whatnot. But the real treat are the pockets on the top part of the suitcase. There's a big mesh one for any last-minute items you remember, and also a waterproof pocket below it. 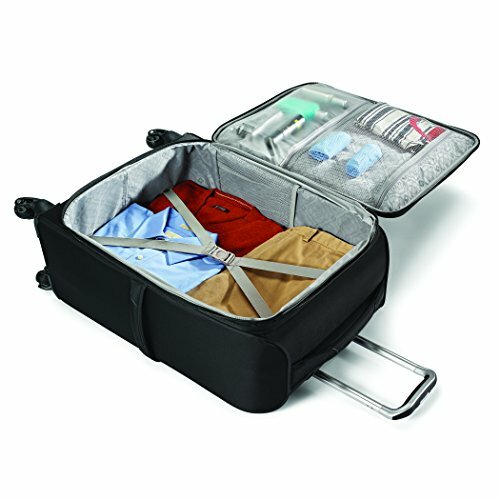 It's called the Wetpack, and it is designed to keep your wet suitcase away from all the dry and ironed shirts. It all comes down to this - do you spend the money on one of these suitcases or not? It really depends on what you need the luggage for. 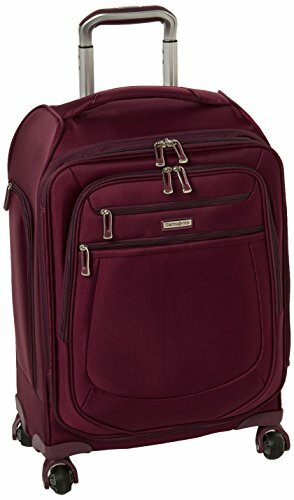 I would recommend these suitcases to everyone looking for awesome, affordable carry ons, and to people who are planning a bus or a train trip that they need luggage for. I wouldn't recommend Mightlight luggage only to people who are in need of big bags that they will eventually check at the airport. That is because I believe hardshells are much better as checked baggage, because softshells don't deal well with the treatment from baggage handlers and they can often get squished. With that out of the way, why should you buy this luggage? 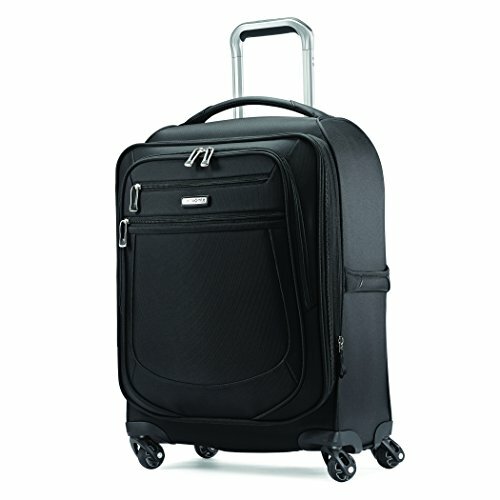 Because it looks good, because it has awesome spinner wheels, a ton of exterior pockets and a huge packing compartment. Also because it is really lightweight and expandable - the Mightlight luggage is everything softside luggage should be, and then some. And makes it totally worth it. Body Dimensions: 19.0" x 15.0" x 8.3", Overall Dimensions: 21.5" x 15.5" x 9.0"
If you still aren't convinced, then head over to Amazon - the prices will convince you.